Elderton Wines Experiences - Starting with a flight from southern Barossa north over the Barossa Valley floor to the town of Nuriootpa, home of Elderton Wines. At Elderton Wines enjoy a unique and personalised tasting with an exclusive look into the history and heritage of Elderton Wines. Visit the 120+ year old Command Vineyard. 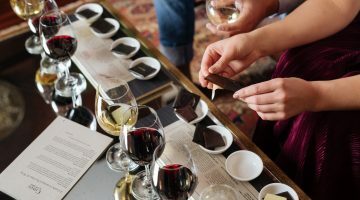 A seated, decadent tasting featuring six wines paired with premium chocolates produced by one of Australia’s master chocolate makers, allowing you to make up your own mind as to the best chocolate to serve with wines of the Barossa. Inclusions: helicopter flight, bottle of Elderton Wine to take home (from the Estate Family Vineyard range only), 2 Barossa Helicopters wine glasses. Exclusions: extra take home wine.